iPhone application development is steadily increasing as it is the second most popular operating system after Android with its market share of 31.83% ( online sources ) in 2017 year. iOS (formerly iPhone OS) is a mobile operating system created and developed by Apple Inc. exclusively for its hardware. It is the operating system that presently powers many of the manufacturer's mobile devices, including the iPhone, iPad, and iPod Touch. The iOS Software Development Kit (SDK) contains the tools and interfaces needed to develop, install, run, and test native apps that appear on an iOS device’s Home screen. Native iPhone application development are done using the iOS system frameworks and Objective-C / Swift language and run directly on iOS. Unlike web apps, native iPhone application are installed physically on a device and are therefore always available to the user, even when the device is in Airplane mode. They reside next to other system apps, and both the app and any user data is synced to the user’s computer through iTunes. 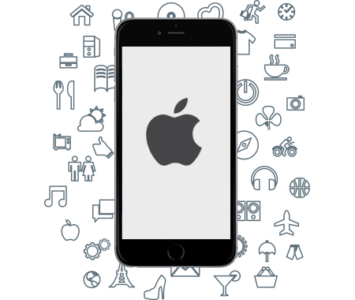 The tools that we use for our custom iPhone application development projects are a standard issue with any profession custom application development. Our experienced team of 7 years are more than capable of designing any app you imagine into a fully functional iPhone application. iPhone applications that we develop are made using OS Software Development Kit (SDK) contains the tools and interfaces needed to develop, install, run, and test native apps. The development of the iPhone application of your requirement is carefully monitored by support softwares like debuggers, external libraries, database management systems, which not only add super exiting features to the application but also make it exciting and interesting for the end user. We provide a bespoke analysis of your requirement and tailor to meet your business needs – go mobile! After the recommendations, are charted out, we create a plan of action. During this phase of the Android application development we work on the software and hardware requirements, the scope and deadlines of the project, any milestones that can be fixed. We inform you about every step and keep you in the loop. We try our best to keep the application development development phase as flexible as possible to avoid any unforeseen difficulties. This is the execution phase. On the requirements of the project we use a variety of iPhone application development methodologies, like Agile or Waterfall during the mobile application development During this phase you will receive updates and suggestions from our project manager, so you are kept up to date during the making of your iPhone application. This is the phase where the application is acid tested repeatedly to churn out any bugs in programming. At this stage of the iPhone application development phase, the application is still not ready for the end user. The iPhone application needs to be hosted on markets and iTunes stores, and then only it can be downloaded and used by users. In this phase we take care of the thousand and one bits and pieces of your iPhone application that must be triple tested before the iPhone application goes prime time. The recently baked out iPhone application is not meant to last forever. Within a few months the iOS version will upgrade, the markets will evolve and the customers will want new features. These changes will call your application to be upgraded. We will maintain an engagement with you and ensure that the investment you have made in software development gives the best value for money.